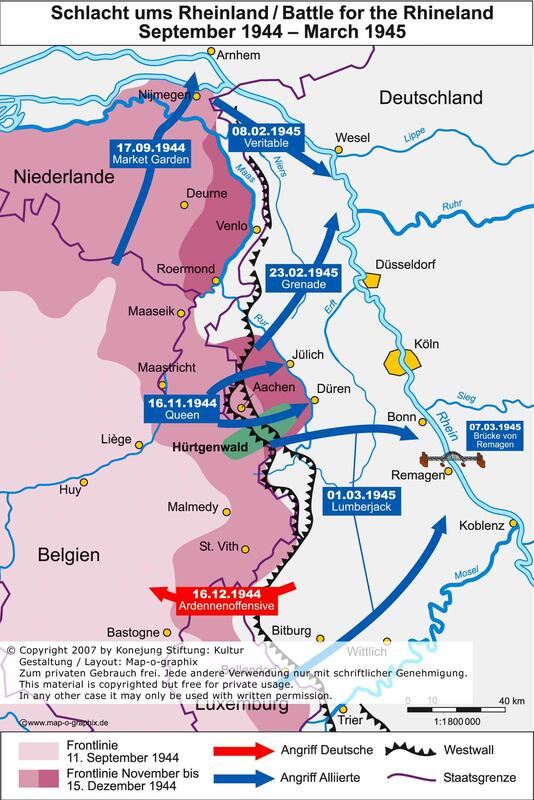 The Battle of Huertgen Forest and along the Siegfried Line from 1944 to 1945 is one of the last great myths of World War II. It is known as the "longest battle on German soil", as well as the "Verdun in the Eifel", as the largest American defeat in Europe. 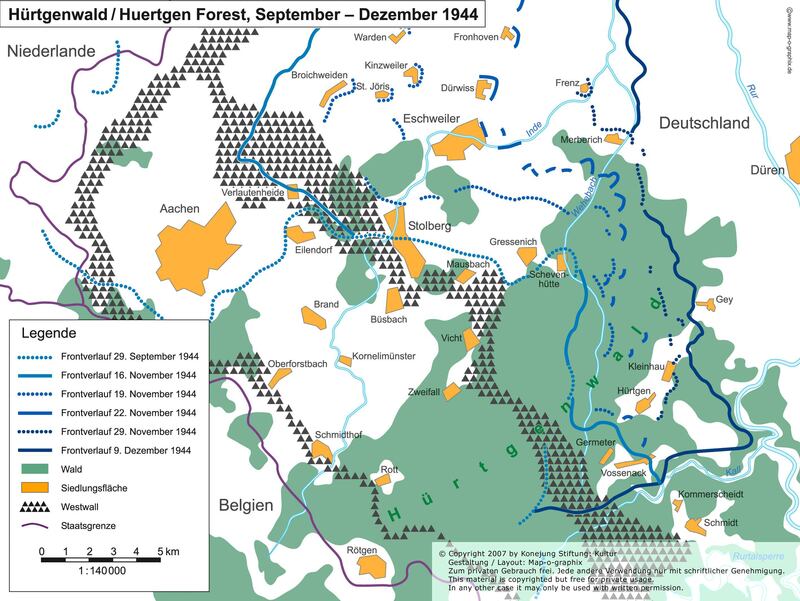 Even the official US-military history speaks of Huertgen Forest as "a black-green ocean of forest, in which Hansel and Gretel had lost their way". Hemingway called the Eifel woods the "forest, where dragons live". Dragons' teeth, the Siegfried line, the Green Hell - terms that remind one of old German myths and fairy tales, of the Nibelungenlied, of the Nazi propaganda about the "eternal forest", of stories of ghosts and evil witches in the deep woods. 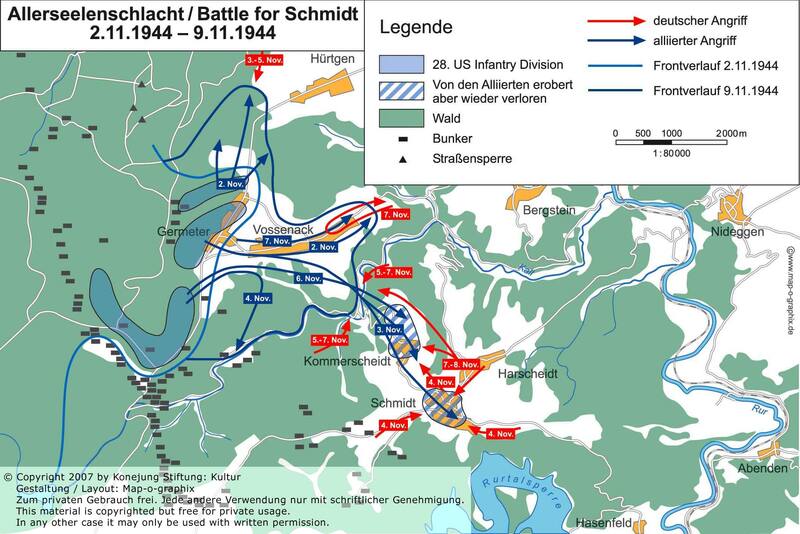 Even today, people still speak of the more than 68,000 dead in the Huertgen Forest and the "All Soul's Day battle" near Vossenack and Schmidt is taught at the School for Command Preparation at Fort Leavensworth, USA, as an American disaster. James Gavin, commander of the 82nd Airborne Division, called the "Bloody Huertgen" a "battle that never should have been fought". Perhaps this is the reason that this historic battle is always in the shadow of glowing victories like the Normandy landings and the crossing of the Rhine at Remagen. For the first time since the fighting over sixty years ago, a film team has now set out to track down the myths and legends and to research the real reasons for this "forgotten battle". After years of research, several surviving veterans in Germany and the United States have been interviewed. Never before seen film footage from the US National Archives and private archives are impressive evidence of the war, the signs of which can still be seen in the forests to this day. The moving interviews with eyewitnesses like the famous photographer Tony Vaccaro or the future Princeton Professor and German emigrant Werner "Tom" Angress underscore the senselessness and brutality of the war as does the statement of the German veteran Kurt Menzel: "Today, I am thankful that I lost my arm on that first day. As a result, I was never able to kill anyone." The project was supported by the Konejung Stiftung: Kultur. All Maps © Copyright 2007 by Konejung Stiftung: Kultur. This material is copyrighted but free for private usage. In any other case it may only be used with written permission. 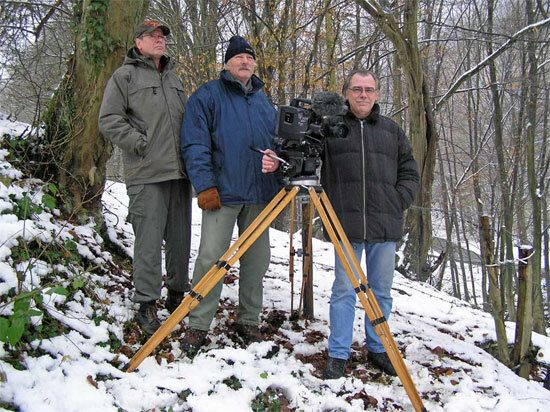 Shooting during a snowstorm on the German-Belgian border near Losheim, starting point of Hitler's Ardenne Offensive on 12/16/1944. 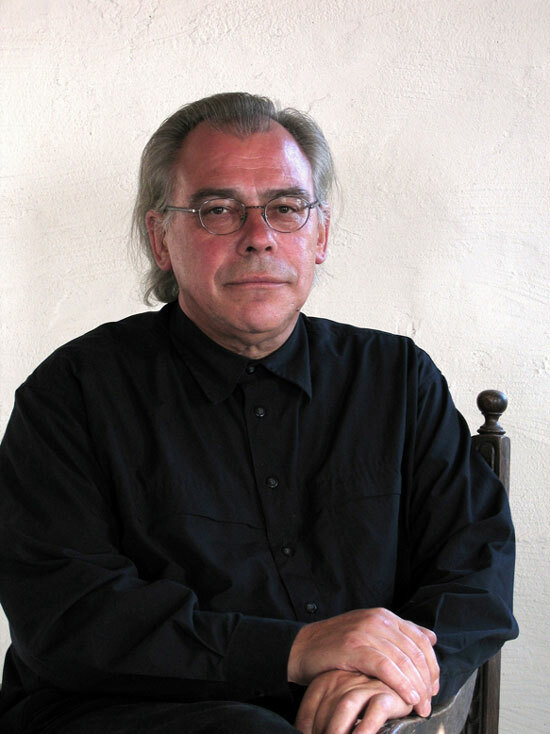 Photo of executive producer Jürgen Teves and director Aribert Weis. 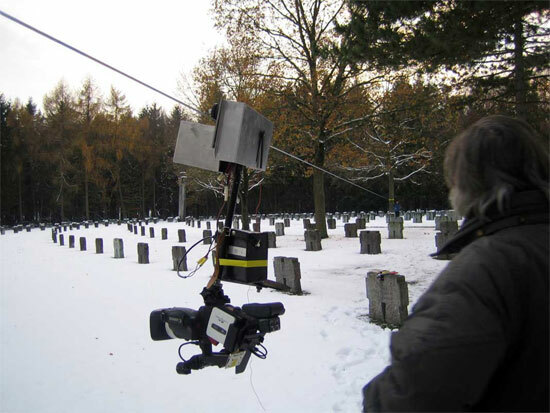 Filming with camera cable car at the Huertgen memorial cemetery, one of two German military cemeteries, where more than 5300 soldiers are buried. 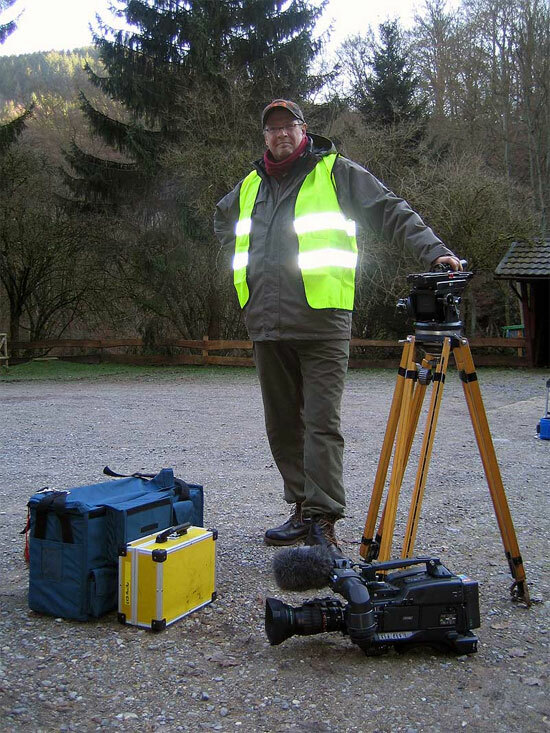 Cameraman Daniel Toelke above the so-called Kall trail, site of the American defeat in November of 1944. This steep and narrow valley is more well-known in the USA than in Germany and was the site of the HBO Films production "When Trumpets Fade", for example. 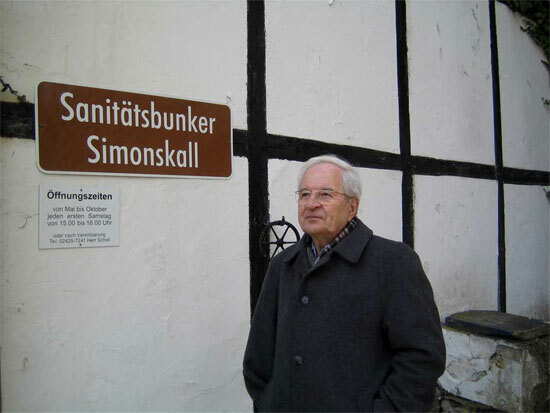 Scriptwriter Achim Konejung at the Mestreng Mill. 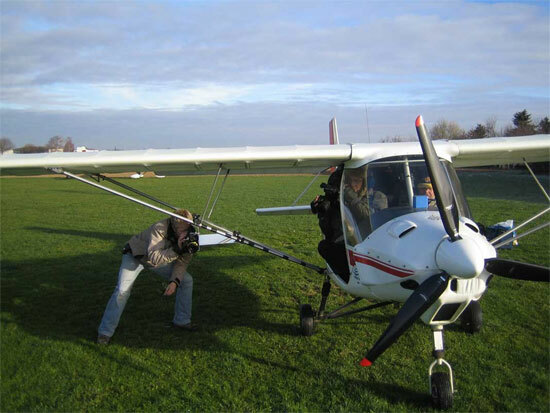 Preparation for low-altitude filming in the Huertgen Forest with an enclosed ultralight aircraft. From left to right: Toelke, Weis, pilot Ahrweiler. 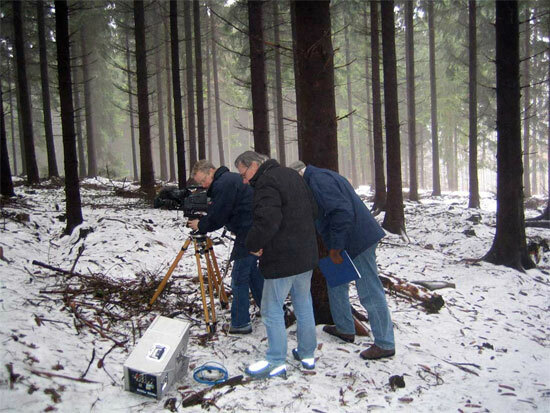 Shooting in the snow-covered Huertgen Forest. Hundreds of soldiers are still missing in this forest. 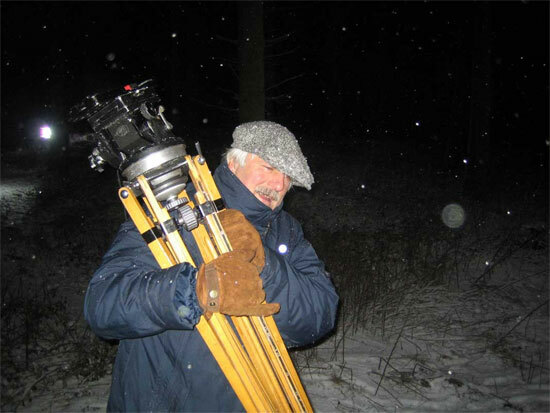 Executive Producer Jürgen Teves during nighttime filming along the "Buhlert" chain of bunkers during a snowstorm. 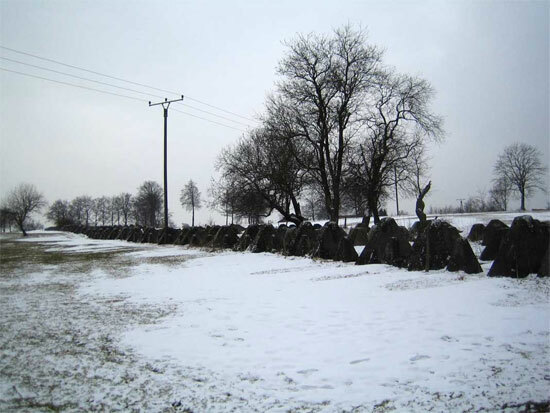 So-called "Höckerlinie" near Simmerath, part of the Siegfried Line built after 1938. These concrete protrusions, which were dubbed "Dragon Teeth" by the Americans, were intended as tank traps, but were largely useless by the year 1944. Eyewitness Kurt Menzel at the site where he was wounded. Menzel came to the Huertgen Forest as a Luftwaffe recruit and was severely wounded there on his first day of service. Today, he is thankful that he lost his arm there, because - as he stated in the interview - "As a result, I was never able to kill anyone". 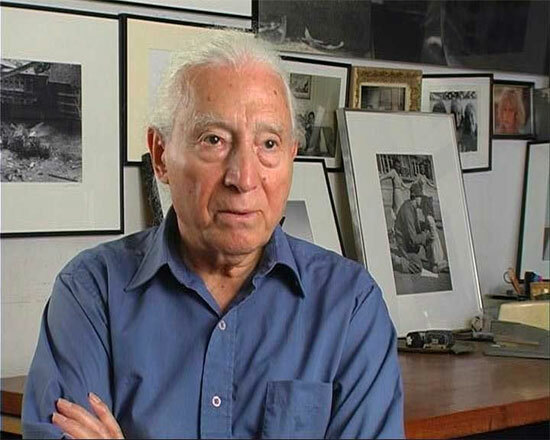 Tony Vaccaro, world-famous photographer ("Entering Germany") and veteran of the campaign from Normandy to the Huertgen Forest to the Elbe, during the interview. All photos can be reproduced if the copyright is acknowledged.